Today while I was cataloging, two 19th century books about railroads crossed my desk. The first was a hefty tome called Rand McNally & Co.’s Enlarged Business Atlas and Shippers’ Guide (1890). It has color maps of all the states, Canada, South and Central America showing all existing railroad lines. It also shows which express companies use which lines. 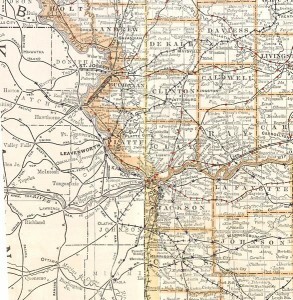 Maps of all other countries are thrown in for “ready reference” as well as maps of major cities and locations of railroad stations and post offices. It is the 24th edition, which clues us into the fact that this atlas was highly useful to any shipping business in the western hemisphere. It also has full returns of the 1890 census. This comprehensive approach must have been as helpful in the 1890’s as the web is for us today. And for us it is a snapshot into the business of shipping and the importance of railroads in the 1890’s. The 2nd book on railroads covering an earlier period, Railway Economy (1850), gets a full description in the Bibliphiles’ Lair (see http://watkinson.wp.trincoll.edu/2011/09/14/all-aboard-newly-acquired-book-on-railroads/). Together the books give us a sense of what land transportation was like before the age of cars and air transportation. 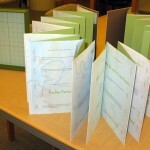 I have always had kind of mixed feelings about artist’s books. 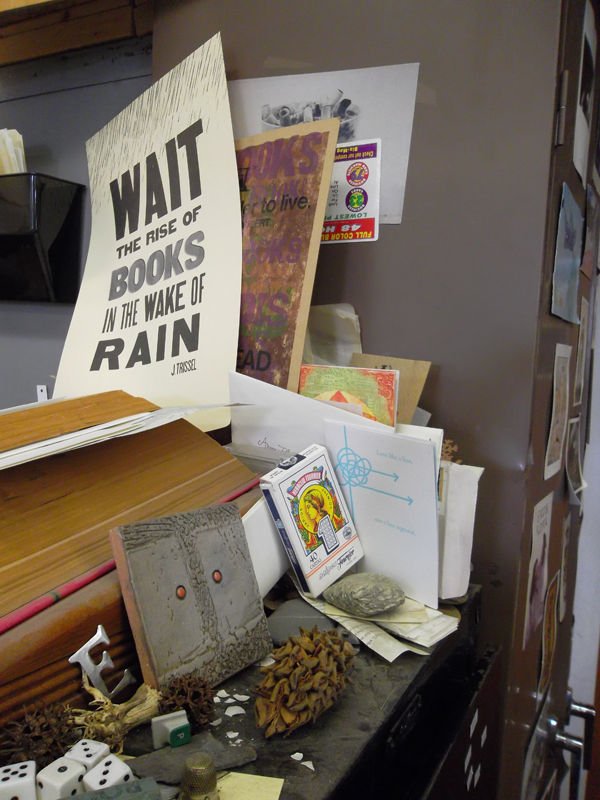 I love fine press books; I love well-crafted, hand-printed books. Yet I just don’t see the appeal of a book that seems to be trying desperately not to be a book, which is the feeling that I get from a lot of artist’s books. I look at them and I see craftsmanship and artistry and even beauty, but I have trouble valuing them as books. I was therefore unsure what to expect when I set out to visit Robin Price’s studio. I had looked at Ms. Price’s website before leaving, and I thought her work seemed interesting enough—but it’s hard to tell with just a few pictures, you know? Especially since my favorite things about fine press books and artist’s books are usually things you can’t really see online. I, for example, like the way you can tell that they’ve been through a letterpress and not a digital printer; I like the way the bindings feel in my hands; I like thinking about the choices behind this paper or that ink. That sort of thing interests me much more than clever or quirky designs. In any case, I was curious to see how I reacted to Ms. Price’s works in person, since that’s the best way for me to take anything away from them. Her work on her website looked interesting, but I wasn’t ready to decide how I really felt about it until I actually held some of it in my hands. We got there in the afternoon; it wasn’t a very long drive from Trinity. The studio is located in a building that was once a mill, so the floors can hold the weight of all the presses—Ms. 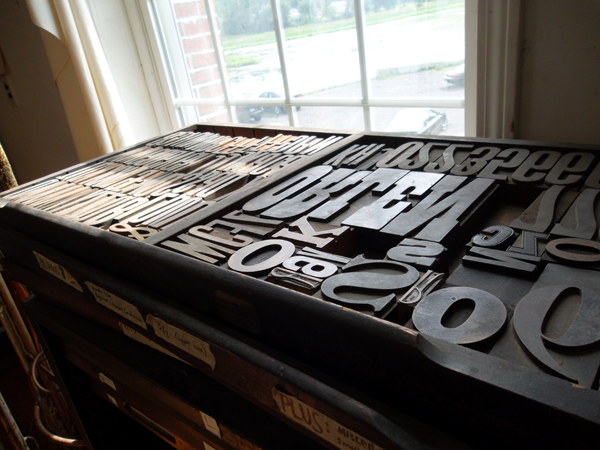 Price had many presses, at least four or five, all of them looking as though they could easily weigh as much as a car. 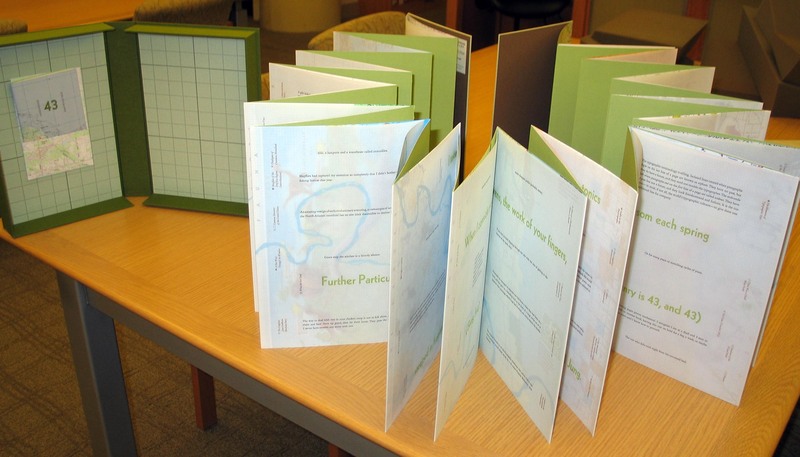 Each one accomplished a different effect, too—each press involved some variation in the printing process, and so made some subtle change in the finished product. Her studio was really very nice, the sort of thing you’d imagine an artist’s studio to be, with all sorts of interesting little bits and pieces stacked on every surface, onions and glass mobiles hanging from the ceiling, and posters and drawings and prints of every kind hanging on the walls. Ms. Price showed us some of her work and spoke about how she did it, and what some of the complications were for making her book, 43. It’s amazing how much work went into it. As it turns out, Ms. Price’s books are the sort of artist’s books I really do like—there is so much attention to craftsmanship and detail in them, and while they’re highly conceptual they’re not so out there that a person can’t hold them and know they’re books and pamphlets. I can only hope that the Watkinson’s new fellowship program will bring even more of this Ms. Price’s sort of creativity to the area. Artist’s books can be gorgeous, fascinating things, and to me at least their heart lies in the relationship between ink, paper, and the press. 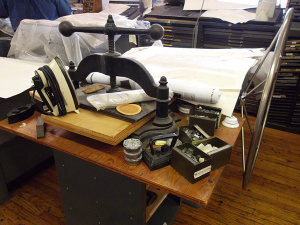 These three components create a seemingly infinite number of possiblities where art and expression are concerned, and once the press at the Watkinson gets up and running I am sure that it will cultivate even more book artistry in the Hartford area. You are currently browsing the I Found It at the Watkinson! blog archives for September, 2011.